Brazilian gastronomy is a mosaic of European, African and Indigenous traditions and ingredients. The country is so big, that depending on where you go, you will find completely different flavours and ingredients. If you go to the Northeast region, in most of the cities by the coast, you will find a delicious fish stew called Moqueca (pronounced “mo-KEH-kah”). It is basically a fish and vegetable stew, with a special extra touch depending on the city you go. 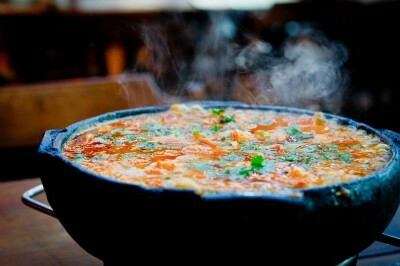 We will teach you how to cook a Bahian style Moqueca so you can have a special and delicious Brazilian dinner at home. As exotic as it may sound, you probably have most of the ingredients already in your pantry. You’ll want to get fresh fish of course, and with prep, the total cooking time is less than an hour. The only special ingredient that may be hard to find is this red palm oil that we call dendê. It has a very particular taste that brings the exoticness to the dish. If you live in a European or American large city, you can look for a Brazilian store and they will have it for sure. If you don´t find it, just use a good olive oil – It will be delicious as well. This recipe serves around 8 people and we usually eat it with white rice. Place fish pieces and the shrimp into different bowls. Add to each the minced garlic and lime juice so that the pieces are well coated. Sprinkle generously all over with salt and pepper. Keep chilled while preparing the rest of the soup. In a large covered pan (we like using clay pots), coat the bottom with about 2 tbsp of palm or olive oil and heat on medium heat. First, add a layer of the sliced onions, the peppers, the tomatoes then the fish, and so on, layer by layer. Then add part of the cilantro, all the coconut milk and the water. Cover the pan and let it cook. Do not strew! After 20min, check if the fish is almost cooked. If it isn’t, leave it for a little more time. Then add the shrimps and leave it for 5 more minutes. When the shrimps are cooked, add some palm oil (around 3 or 4 tbl spoons) and the rest of the cilantro. If you enjoyed the recipe, contact us when coming to Brazil – we can tell you where you can find the best Moquecas and take you to a Brazilian culinary class so you can learn more about our cuisine!